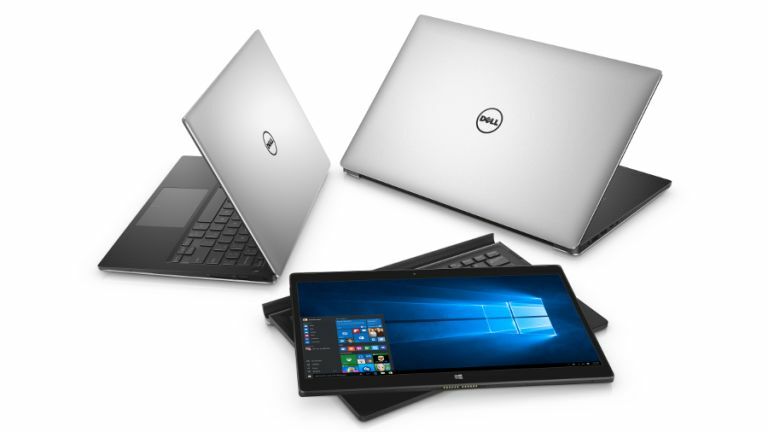 Dell has announced a trio of new XPS devices, including a pair of new notebooks – the XPS 13 and XPS 15 – and a smaller 2-in-1, the XPS 12. Naturally, all of these machines run Windows 10, and also boast the latest sixth-generation (Skylake) Intel Core processors. Let's delve in a bit more detail, starting with the biggest notebook first. Dell describes the XPS 15 as a powerhouse, with GeForce GTX 960M graphics (featuring 2GB GDDR5 of on-board memory) and up to 16GB of RAM backing that Skylake CPU. Storage options include up to 1TB hard disk or 1TB PCIe SSD. This is a premium laptop, too, benefiting from a machined aluminium and carbon fibre chassis to ensure smart aesthetics and a light weight for portability (the XPS 13 is similarly constructed, by the way). The big feature with the XPS 15, though, is the screen, which is the first InfinityEdge (virtually borderless) display on a 15-inch laptop, which Dell claims makes it the smallest 15-inch notebook ever made because the display bezels are so slim. (Also note that the machine is between 11mm and 17mm thick in terms of profile, and weighs 1.78kg). The display has a resolution of 3840 x 2160 with accurate and vibrant colours, with another Dell boast being the fact that the screen offers 100% minimum Adobe RGB. Battery life is claimed at up to 17 hours, although that's with a full HD display. Moving on to the XPS 13, again this uses the InfinityEdge display and Dell claims this means it's the world's most compact 13-inch laptop. Much the same as the XPS 15, the notebook can have up to 16GB of memory on board, and up to 1TB SSD. Battery life is rated at just over 18 hours with the XPS 13, and again this is with a full HD display. Finally, we have the XPS 12, a 2-in-1 device which can easily transform from laptop to tablet (the screen is attached to the base via a magnetic connection). The base unit has a full-size backlit keyboard and touchpad, with a Dell Premier Folio provided to be used as a stand for the tablet, and for protection when you're out and about with it. You can also plump for a 4K screen with the XPS 12, which has a pair of cameras on board – one 8 megapixel rear camera, and a 5 megapixel front-facer. Both the XPS 13 and XPS 15 are on sale from today starting at £849 and £1099 respectively. As for the XPS 12, the release date or price haven't yet been confirmed, with Dell simply stating that this machine will be available in the coming months.